It is our pleasure to release to the public an invitation to the inaugural exhibition at Shot Images, ‘Off The Line’, featuring photographic works by students and collaborators of Alternatives, a Chicago not-for-profit youth center based in Uptown. This will be the first time that these budding, urban youth have been given a chance to show their works in a gallery setting, and proceeds from this show will directly fund their after-school creative programs. The works in this exhibition chronicle the gritty but brilliant urban landscape that is Chicago. 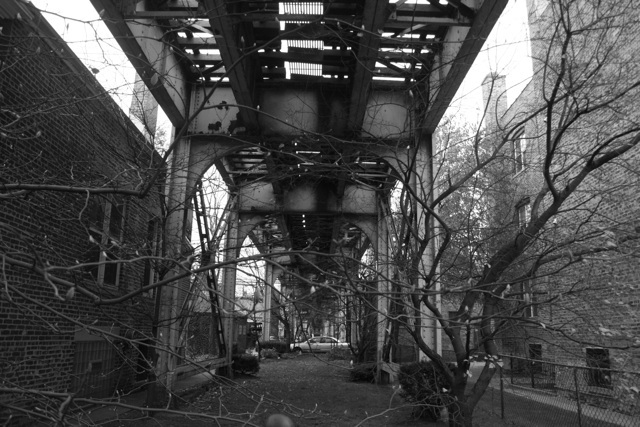 Through this show we follow the youth’s camera lenses through abandoned, often discarded Uptown, along the ‘L’ lines, through the ignored and hidden settings that build up the captivating maze that is our prided city. In this show we see portraits of locals, the glittering Chicago River, our favorite theaters, the many seasons that captivate our senses, and much more Chicago-based imagery. Connect Force, the specific program of Alternatives that this exhibition funds, functions as a positive space for members of all ages of the community to participate in the Hip-Hop Arts, including mural painting, breakdancing, DJing, poetry writing, and so much more. The space based on Lawrence and Sheridan Road allows people to flourish creatively in a supportive, beneficial environment, encouraging healthy life choices, and offering everything from homework help to the use of a new up-and-coming darkroom for the photographers to develop and hone their skills. Started in 2001, Connect Force has grown to incorporate hundreds of different speakers and volunteers from around the world, boasting a truly multicultural experience. While CF gains most of it’s funding through small grants and government funding, recent Illinois state budget cuts have made it increasingly difficult to offer as much programming and support as they would like to. Come to the opening to appreciate the photos of our city’s youth, full of infectious curiosity and true love for the city of Chicago! Shot Images is a newly opened gallery located in Niles, Illinois. We focus on promoting work by emerging and established photographers, and providing our clients with the highest quality, limited edition archival photographic prints. This entry was posted in Openings and Events and tagged Alternatives, Connect Force, photography, Shot Images. Bookmark the permalink.